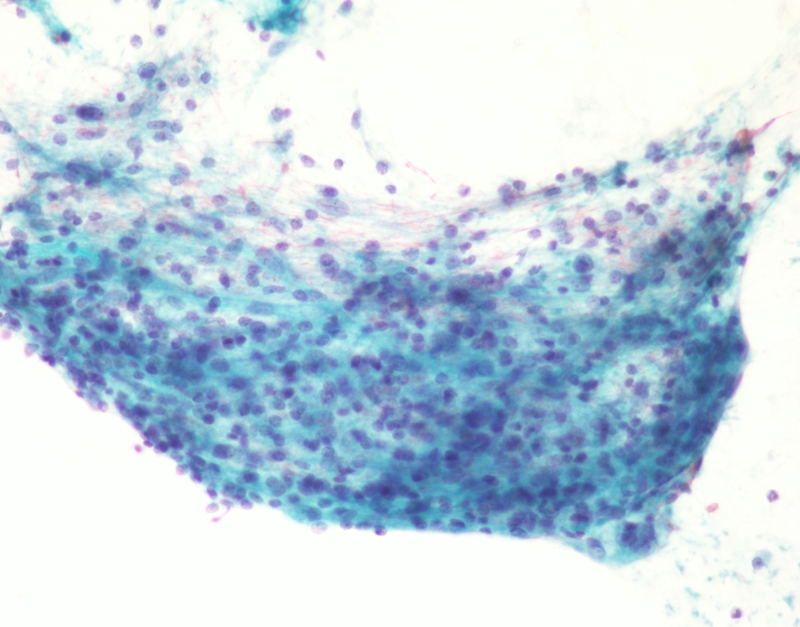 A 55 year old female, thyroid nodule FNA. In these smears we have a hypercellular specimen composed exclusively of hurthle cells. The nuclei have a prominent nucleolus, and there is abundant granular cytoplasm. No colloid, normal follicular cells, macrophages or lymphocytes are seen in the background. 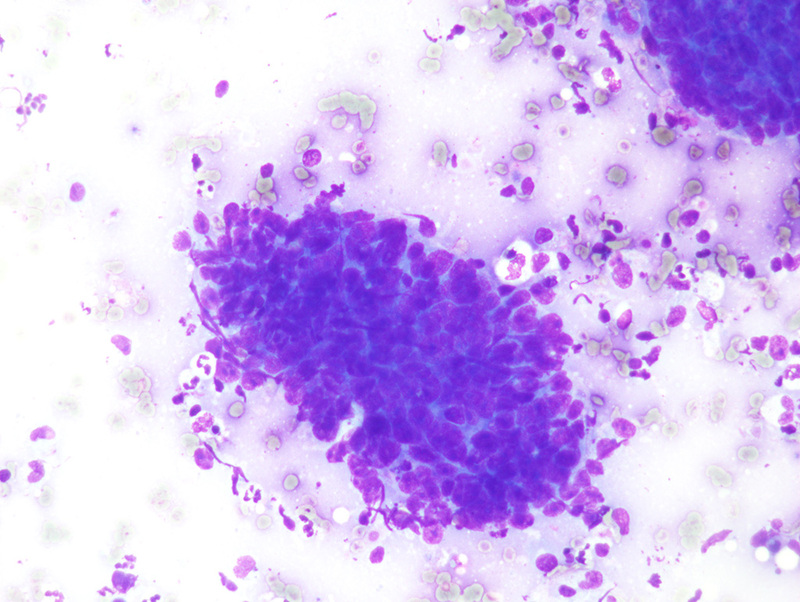 No colloid or macrophages are seen in the background, which when associated with Hurthle cells are all components of a benign multinodular goiter. No lymphocytes are seen in the background either to suggest lymphocytic thyroiditis, commonly featuring Hurthle cell change. The differential also includes oncocytic variant of PTC, which would show characteristic nuclear features of PTC, and it is not seen in this case. In this scenario where only an abundance of Hurthle cells is present lacking other cell types and colloid, the most appropriate diagnostic category is suspicious for Hurthle cell neoplasm. On follow up for this case, the patient had a Hurthle cell carcinoma with capsular/vascular invasion. Presented by Dr. Zahra Maleki and prepared by Dr. Amy Zhou. A 44 year old female with a perigastric soft tissue mass. 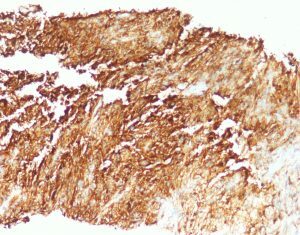 This is a hypercellular spindle cell lesion with large cohesive fragments composed of spindled cells. Most of the nuclei are oval and mostly uniform in size. Few nuclei are larger but no mitosis or necrosis is appreciated. These features suggest that the lesion is a benign neoplasm of mesenchymal origin. The top differential diagnosis given the morphology and location include leiomyoma, schwannoma, and gastrointestinal stromal tumor (GIST). A malignant counterpart of these lesions is less likely, as malignant mesenchymal tumors tend to be more discohesive, pleomorphic, mitotically active and necrotic. Leiomyoma tends to have cigar-shaped nuclei with indentation. Schwannoma tends to form large cohesive fragments and have wavy nuclei with palisading. Although characteristic cytomorphologic features may suggest a specific entity or line of differentiation, a definitive distinction depends on immunohistochemical studies. A reasonable panel in this case includes desmin for smooth muscle origin, c-kit and DOG-1 for GIST, and S100 for schwannoma. In this case, S100 was diffusely positive while the other markers were negative, supporting a diagnosis of schwannoma. 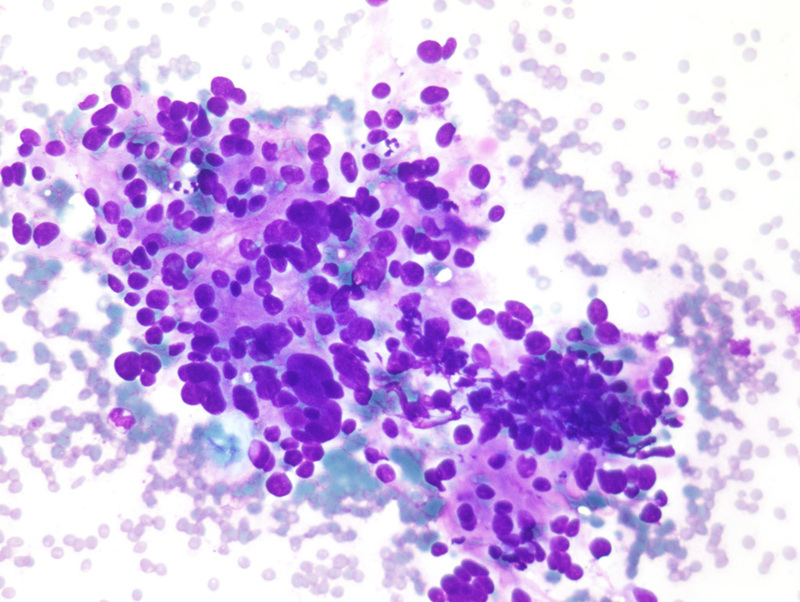 Cytologic description: the smears show various highly atypical pleomorphic cells with irregular nuclear contours, large nuclei and prominent nucleoli. The chromatin pattern is coarse and irregular. 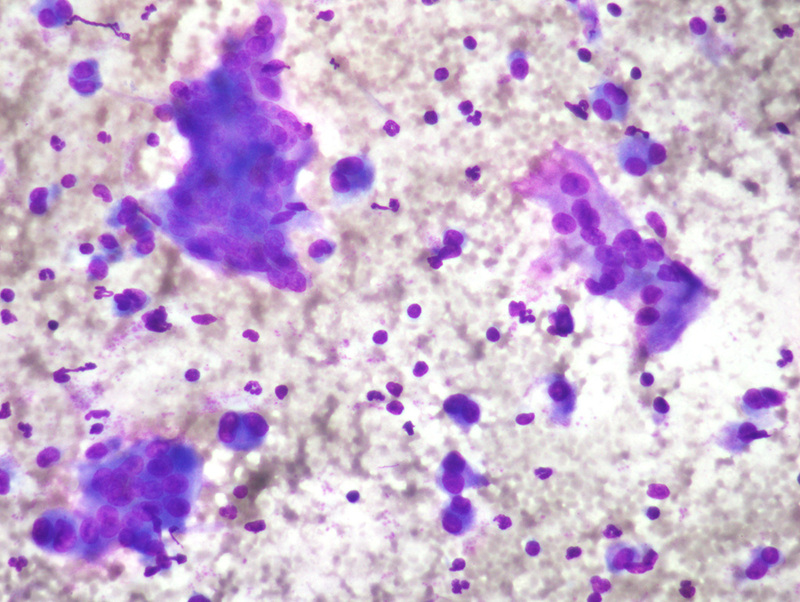 The cells are not cohesive, and some debris possibly representing necrosis is seen in the background. Differential diagnosis: Given the patient’s age and location of the lesion, metastatic germ cell tumor is the top differential, this time a higher grade variant such as embryonal carcinoma. Also in the differential diagnosis are melanoma and poorly differentiated carcinoma. Lymphoma is less likely as the cells do not have a lymphoid appearance. 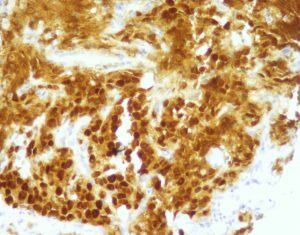 Immunostains will help cinch the diagnosis in this case, as embryonal carcinoma is positive for OCT-4 and CD30. Various cytokeratins are positive, but melanoma markers such as HMB45 and CD45 will be negative. 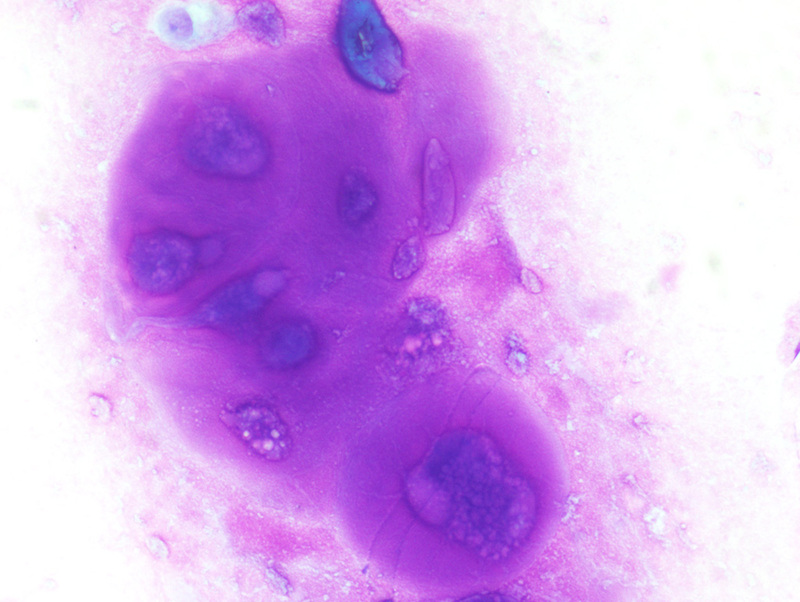 Cytologic description: The smear shows a hypercellular specimen composed of dispersed, large round to oval epithelioid cells. Some are plasmacytoid in appearance. 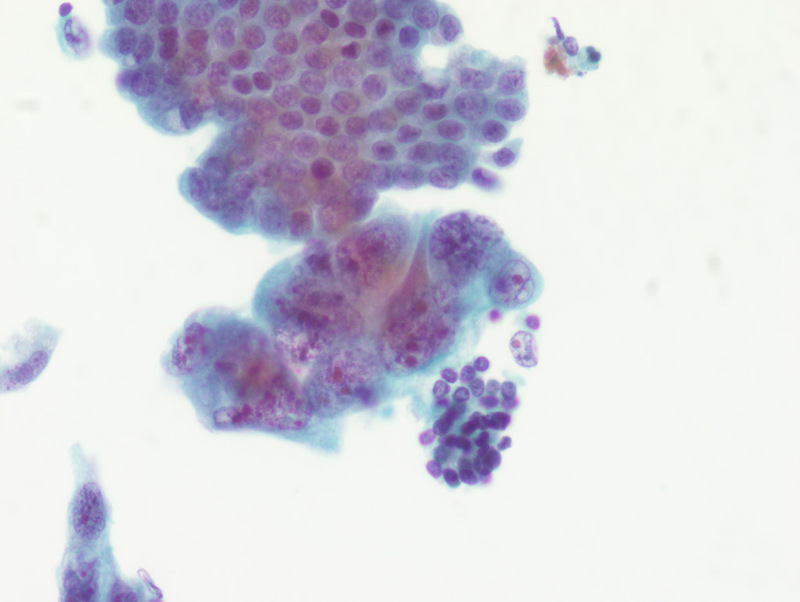 On the pap stain we can appreciate large nuclei and prominent nucleoli. The cells have a monotonous appearance. Differential diagnosis: Given the patient’s age and location of the lesion, metastatic germ cell tumor is the top differential, especially seminoma in the case of round monotonous cells with prominent nucleoli. The dispersed nature of the cells raises a concern for lymphoma, but in some areas the cells are still somewhat cohesive. Melanoma always enters into the diagnosis for any malignancy especially if discohesive or with prominent nucleoli. Immunostains are helpful in this case, as seminoma is positive for OCT-4, PLAP, SALL4, and CD117. They are usually negative for various cytokeratins, melanoma markers (S100, SOX10 etc. ), and CD45. A 60 year old male with a history of head and neck malignancy who presents with an abdominal wall mass. A 60 year old male with a history of head and neck malignancy who presents with an abdominal wall mass. Fine needle aspiration. 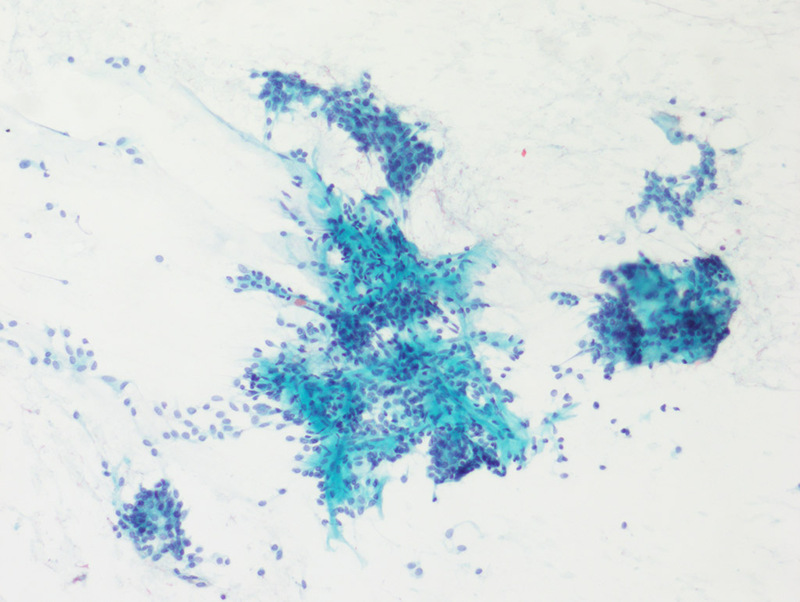 These Diff-Quik stained smears show clusters of tightly packed small blue cells. 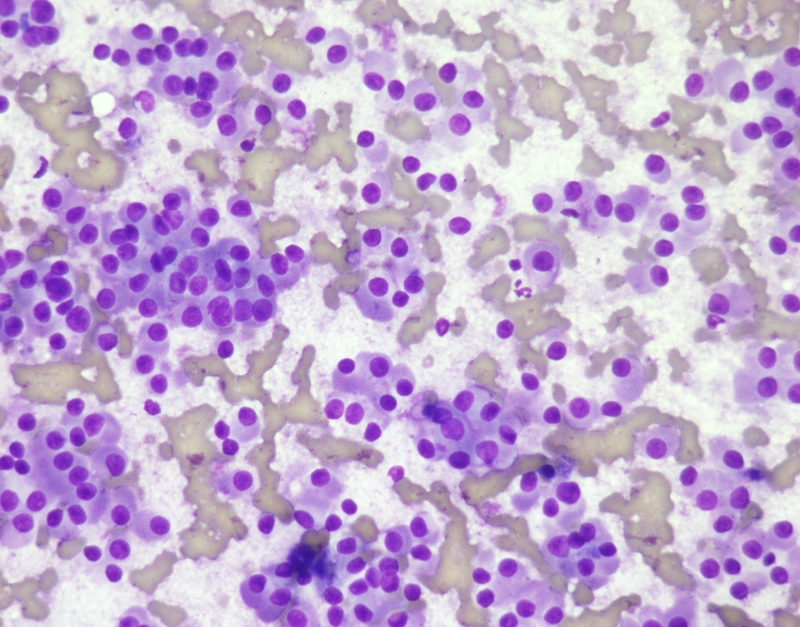 The aggregation of these cells favors a carcinoma over a lymphoma, which tends to show dispersed sheets of cells. 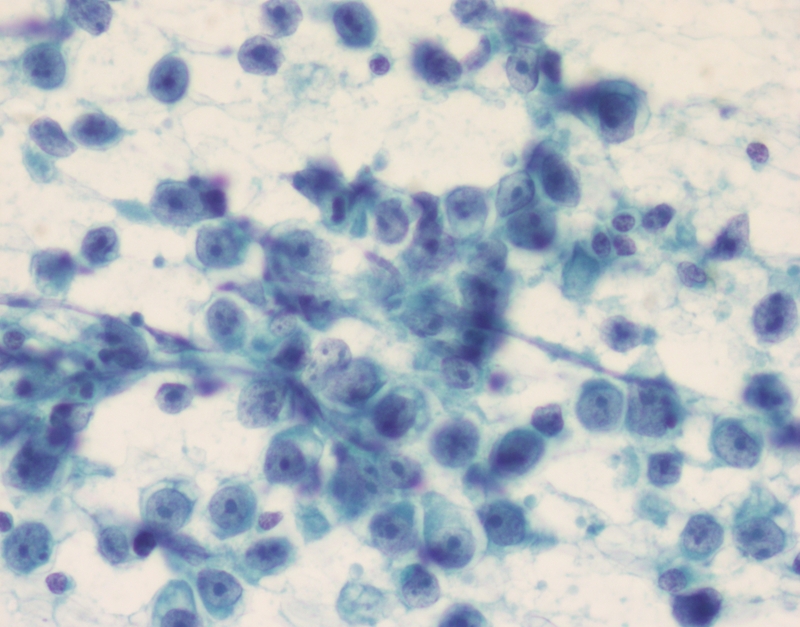 The tumor cells have a high N/C ratio and a basaloid appearance with round to oval nuclei. Some cells show prominent nucleoli. The diagnosis in this case is a poorly-differentiated carcinoma, but needs to be further classified. Small cell carcinomas enter into the diagnosis, but despite their high N/C ratio falling, these tumor cells do not show characteristic molding or apoptosis seen in small cell carcinomas. Given the patient’s history of a head and neck malignancy, metastatic nasopharyngeal carcinoma is the best answer. A basaloid squamous cell carcinoma would be an equally valid choice. 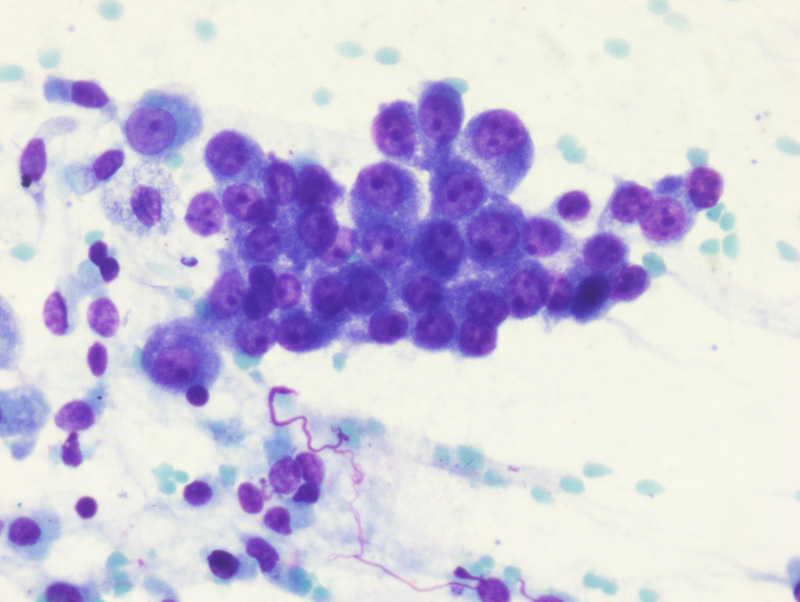 In general, metastatic nasopharyngeal carcinomas show mild to moderate nuclear pleomorphism, vesicular chromatin, and scanty cytoplasm with ill-defined cytoplasmic borders. 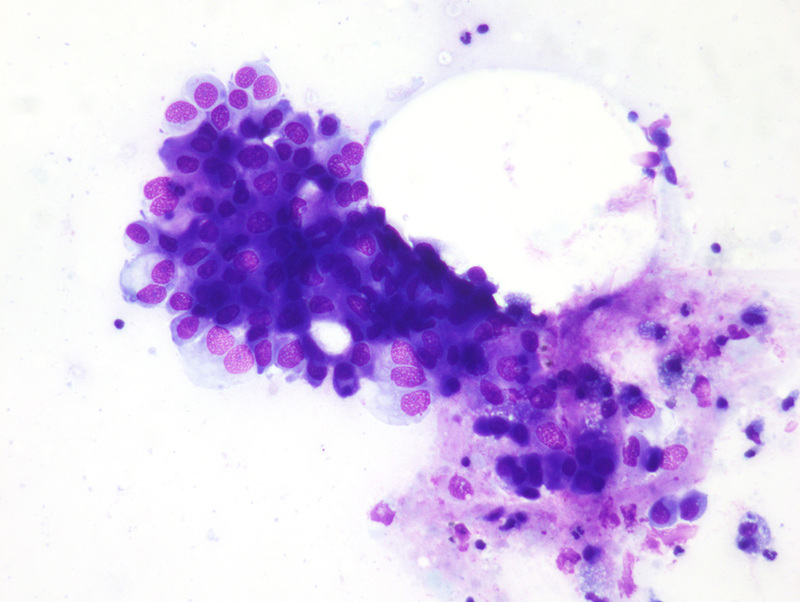 This patient had a recent history of nasopharyngeal carcinoma that was EBV positive. 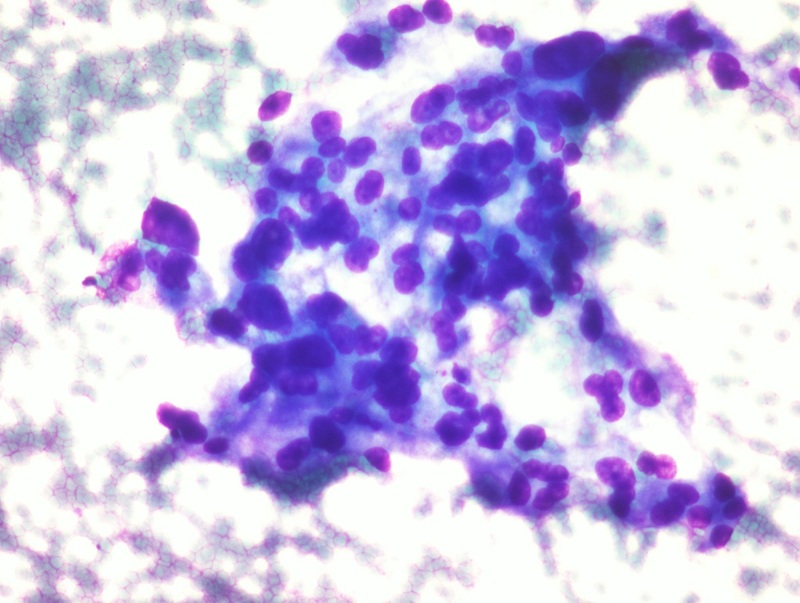 Acinic cell carcinoma presents with polygonal cells, with bland nuclei and abundant granular cytoplasm. High grade mucoepidermoid carcinoma may be pleomorphic or poorly-differentiated, but characteristically show some degree of mucinous differentiation. 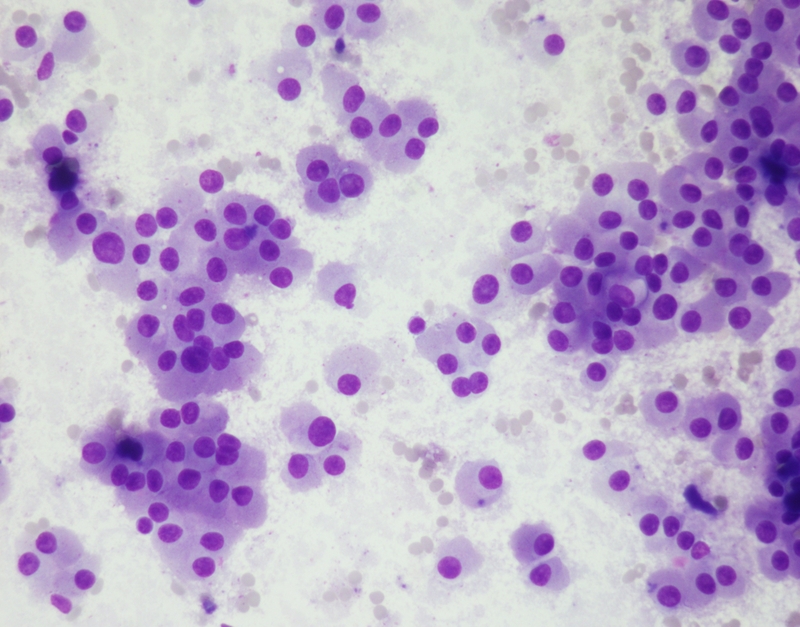 This case shows osteoclast-like giant cells with many nuclei (up to 50) and granular cytoplasm. 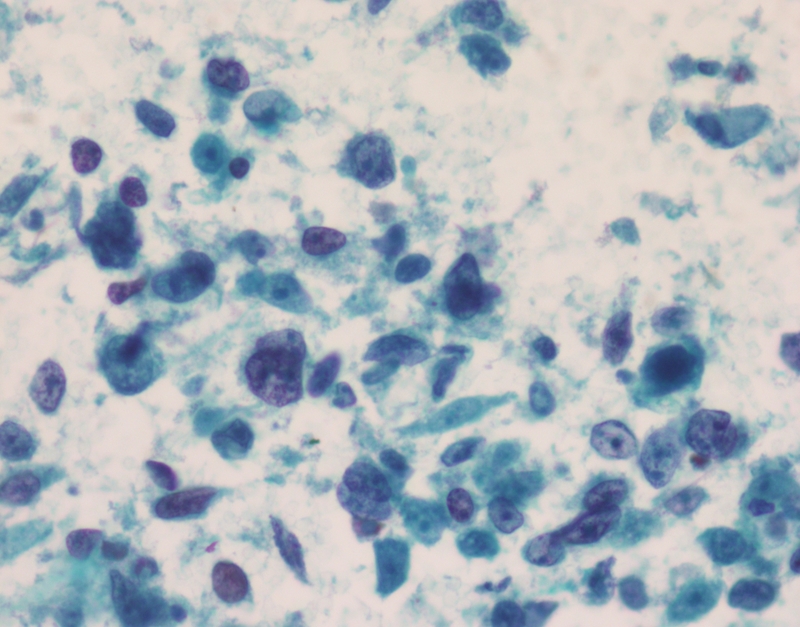 The background also shows few single cells including spindle-shaped stromal cells. The giant cells and stromal cells are often attached to each other. The cytoplasm can be vacuolated and may have well-defined borders and metachromatic granules. 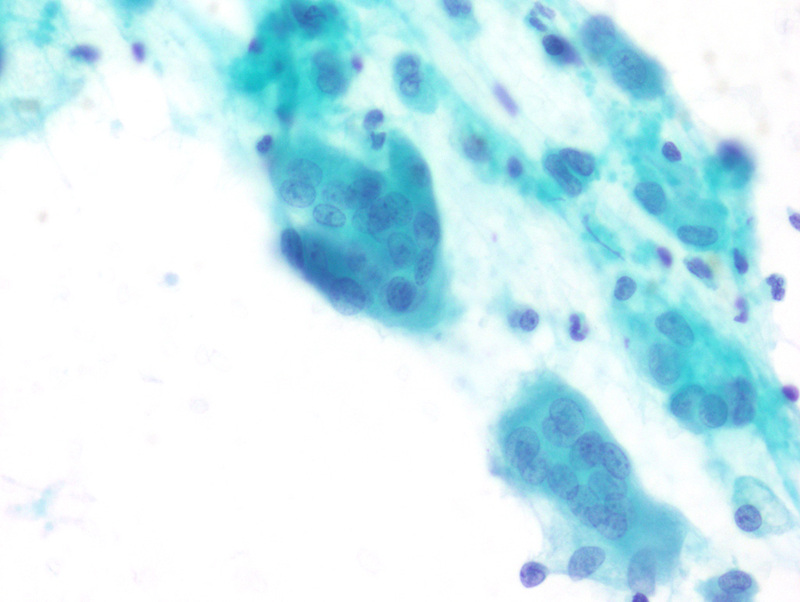 The giant cells in this case are the biggest clue to the diagnosis. Given the granular magenta appearance of the cytoplasm, chordoma and chondrosarcoma also enter into the differential diagnosis. However, neither of those entities are characterized by multinucleated giant cells. 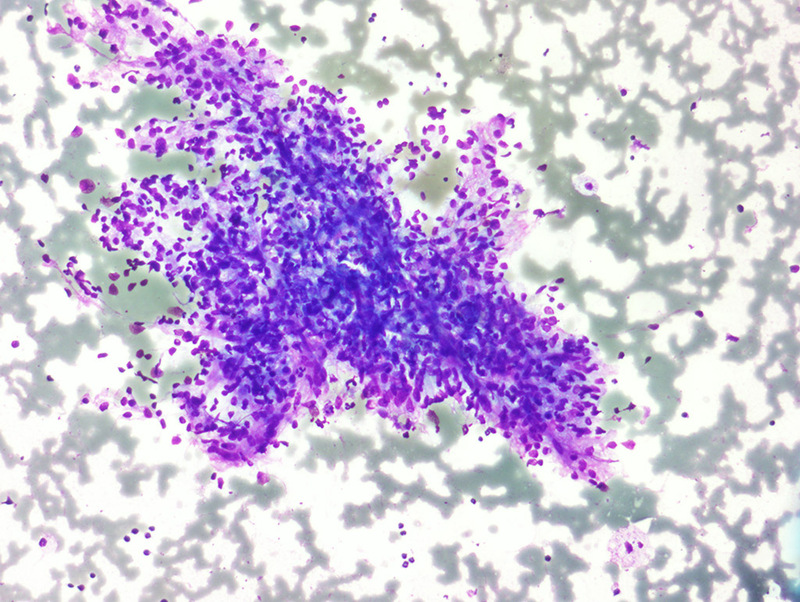 The stromal cells of giant cell tumor are best seen on Diff-Quik stain. These Diff-Quik stained images show a characteristic thick, bright magenta, amorphous matrix material surrounding large polygonal cells. There can be a variable degree of lacunar formation, which in our case is relatively prominent. 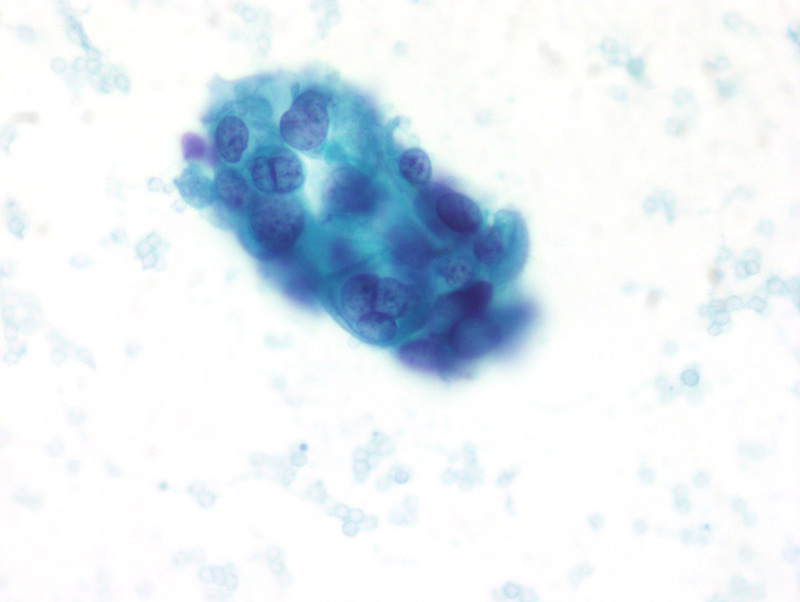 Cells are unevenly dispersed and some can be binucleated, with small blue cells admixed in. Nucleoli are often prominent. Calcification and ossification may be present (not seen in this case). Chondrosarcoma is common in young patients. The main differential diagnosis in these cases includes chondrosarcoma and chordoma. Ependymoma and poorly differentiated adenocarcinoma are less likely. Chordomas typically have a similar magenta myxoid matrix, but the cells have more prominently vacuolated cytoplasm (physaliphorous cells). Immunostains can be helpful in this setting. Both chordomas and adenocarcinomas are positive for cytokeratins, while chondrosarcomas and ependymomas are negative for cytokeratins. Chondrosarcomas and chordomas are both positive for S-100, but chordoma is positive for brachyury and chondrosarcoma is not. Ependymomas, on the other hand, express glial fibrillary acid protein (GFAP). A 65 year old female with a mass in the head of the pancreas. A 65 year old female with a mass in the head of the pancreas. Endoscopic ultrasound guided fine needle aspiration. 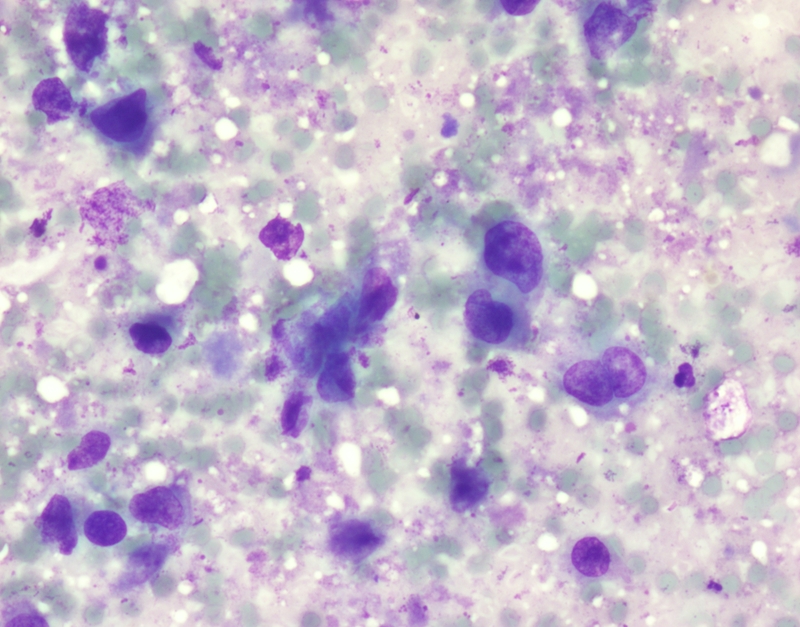 Cytologic description: This case is almost exclusively composed of osteoclast type giant cells, featuring centrally clustered, overlapping nuclei with bland chromatin and occasional nucleoli. 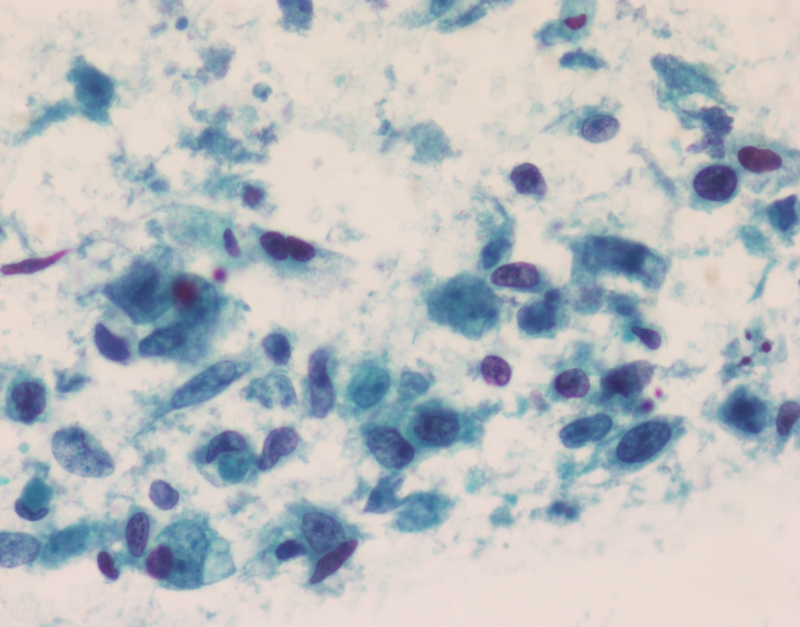 The cytoplasm is abundant, dense and cyanophilic on the pap stain. Malignant undifferentiated epithelioid mononuclear cells are the malignant component of this tumor, while the giant cells themselves are benign. The malignant mononuclear cells harbor KRAS mutations in about 90% of cases, and TP53 mutations in about half of the cases. Undifferentiated carcinoma with osteoclast-like giant cells tends to occur in the head of the pancreas in older adults (> 60 years) with a slight female predominance. This is a rare tumor with poor prognosis. Differential diagnosis: The main differential diagnosis includes ductal adenocarcinoma, NOS, which does not induce osteoclast-like giant cells. Anaplastic carcinoma of the pancreas often shows bizarre tumor cells, some of which may be multinucleated and resemble giant cells. The osteoclast-like giant cells are usually so distinctive as to make diagnosis straightforward. 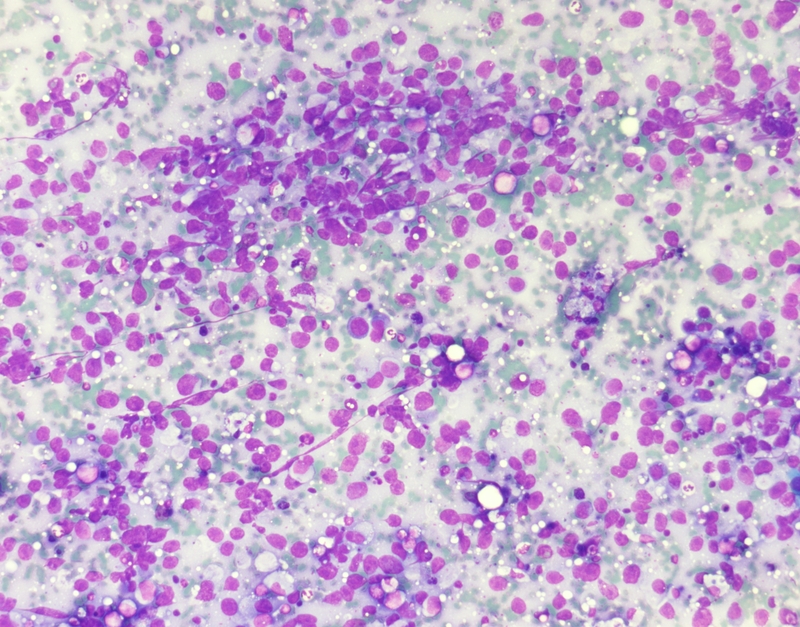 However, other neoplasms of the pancreas, particularly when necrotic, can be associated with a giant cell reaction. Immunohistochemistry can be helpful in these cases, with the giant cells staining for CD68 and mononuclear malignant cells staining for epithelial markers (AE1/AE3, CAM5.2, CEA, and/or EMA) in 50-70% of cases. Presented by Dr. Zahra Maleki and prepared by Amy Zhou. A 59 year old male with a mass in the head of the pancreas. A 59 year old male with a mass in the head of the pancreas. Endoscopic ultrasound guided fine needle aspiration. 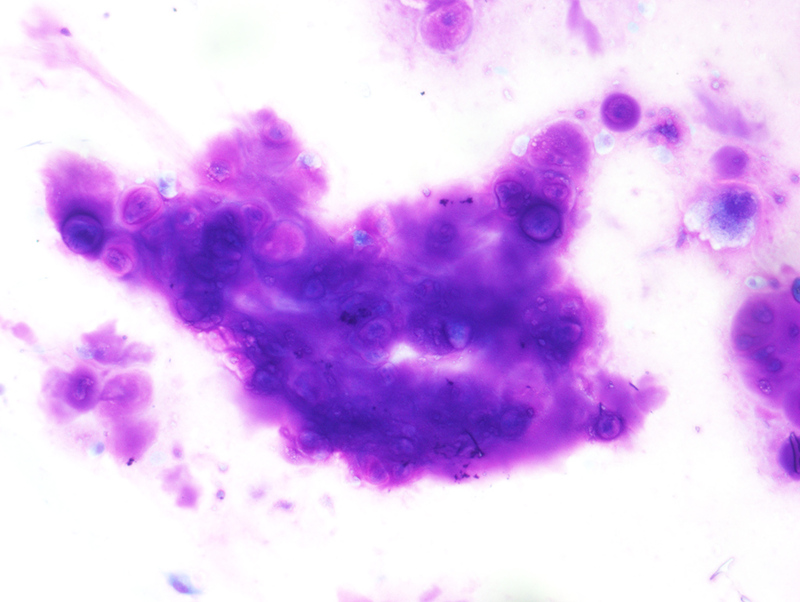 Cytologic description: This case shows 3-dimensional glandular groups with anisonucleosis (4:1 ratio), nuclear crowding, and loss of polarity. The cells show nuclear membrane irregularities, hyperchromasia, and prominent macronucleoli. In terms of differentiation, this tumor was characterized as moderately differentiated. Well differentiated adenocarcinoma shows loss of honeycomb architecture, replaced by the “drunken honeycomb” with uneven spacing of cells. Nuclear crowding, overlapping, and loss of polarity is also seen in well differentiated adenocarcinoma, but usually does not form 3-dimensional groups with prominent macronucleoli. 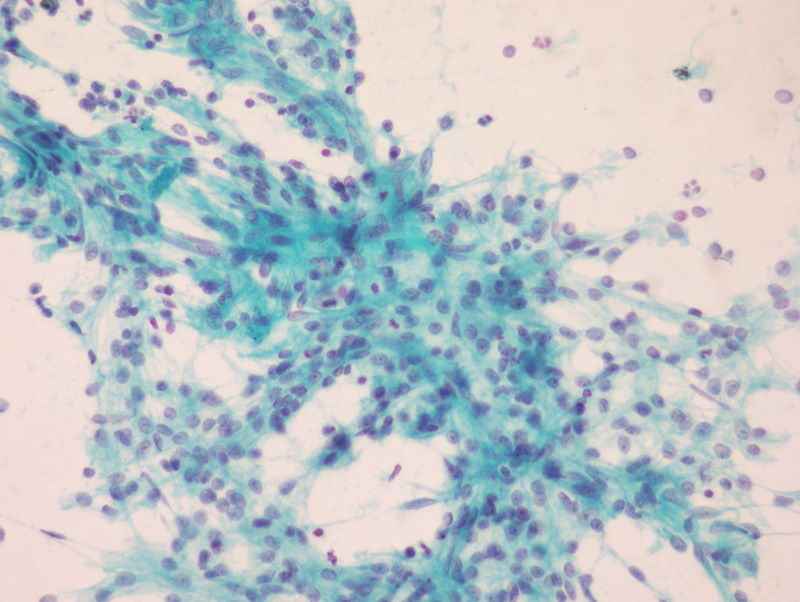 On the other hand, poorly differentiated adenocarcinomas are characterized by abundant necrosis and discohesion with single intact malignant cells. Differential diagnosis: The amount of pleomorphism seen in the tumor cells is too great to be attributed to reactive changes alone, and points to a ductal adenocarcinoma. Pancreatic neuroendocrine tumor typically has abundant, cytologically bland tumor cells with speckled neuroendocrine chromatin. 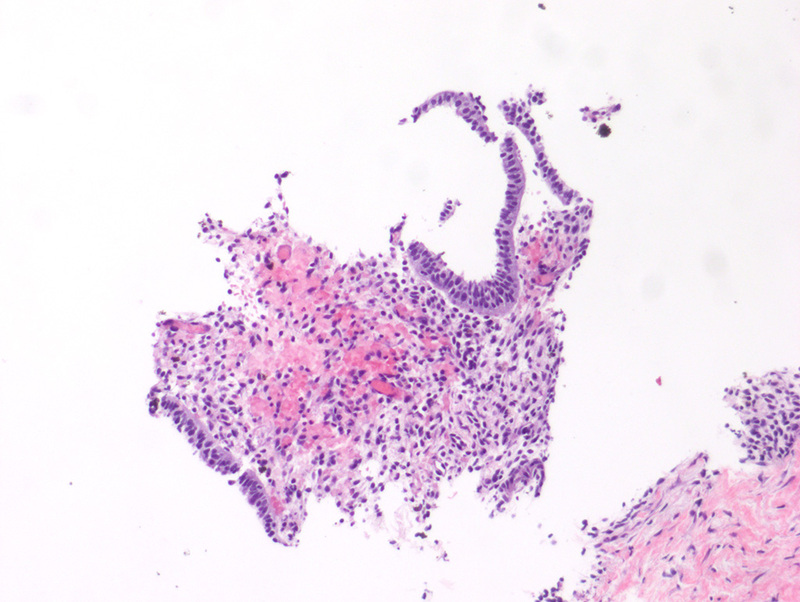 Mucinous cystic neoplasm and intraductal papillary mucinous neoplasm are typically cystic lesions with abundant mucin and/or mucinous epithelium, which is not appreciated in this case. Presented by Dr. Maleki and prepared by Amy Zhou. A 45 year old female with a left neck mass. A 45 year old female with a left neck mass. Fine needle aspiration. 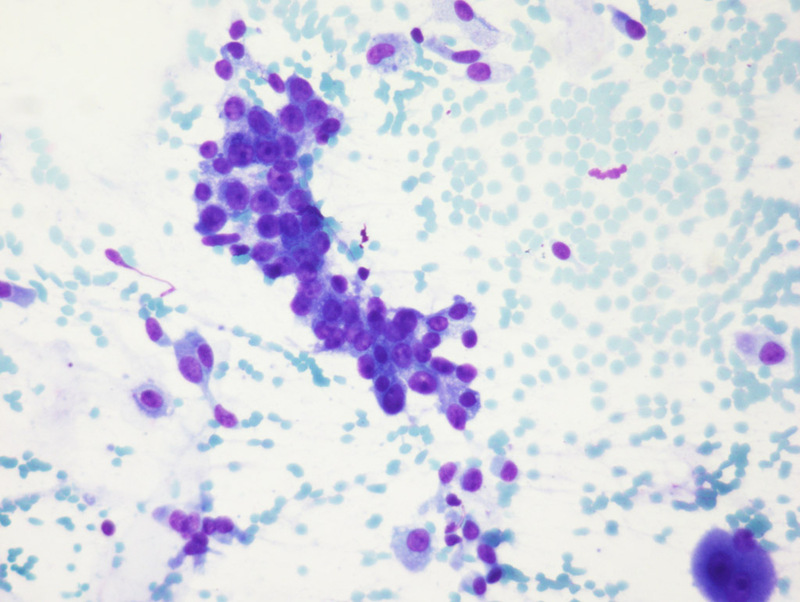 Cytologic features: Paraganglioma cells are round to ovoid, plasmacytoid and spindly, arranged in loosely cohesive groups. Scattered single cells and stripped nuclei are seen in the background. The tumor cells contain eccentric round to ovoid nuclei, fine chromatin, small nucleoli, a moderate amount of granular basophilic cytoplasm, and ill-defined cell borders. Occasionally, nuclear pleomorphism and pseudonuclear cytoplasmic inclusions may also be seen. Paraganglioma cells are positive for neuroendocrine markers (e.g., chromogranin, synaptophysin, CD56). 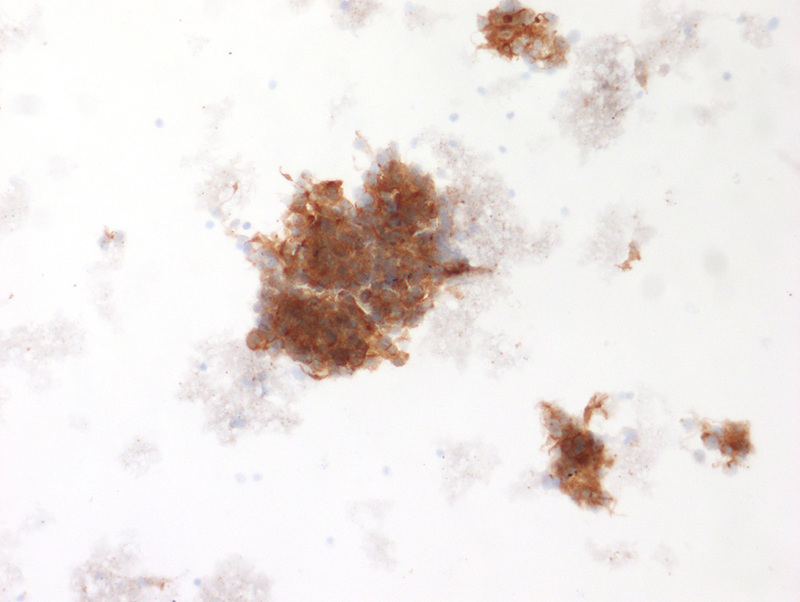 Scattered S-100 protein positive sustentacular cells are also seen. In contrast to thymic neuroendocrine tumors, paraganglioma is usually cytokeratin-negative. Differential diagnosis: Morphologically paragangliomas bear resemblance to metastatic renal cell carcinoma (RCC). However, RCC usually shows fluffier, vacuolated cytoplasm with prominent nucleoli. Much more nuclear pleomorphism is expected in malignant melanoma, with prominent, often cherry red nucleoli. Papillary thyroid carcinoma may also have nuclear pseudoinclusions, but usually has much less cytoplasm with prominent nuclear enlargement, overlapping and papillary architecture. Immunostains are useful in confirming the diagnosis. A 46 year old female with an abdominal wall nodule. Fine needle aspiration. Cytologic features: Endometriosis is the presence of endometrial glands accompanied by endometrial stroma in abnormal locations. The smears show clusters of epithelioid cells with round to oval nuclei and small nucleoli. The nuclear contours are regular and the chromatin is fine. Cells have ample pale cytoplasm. 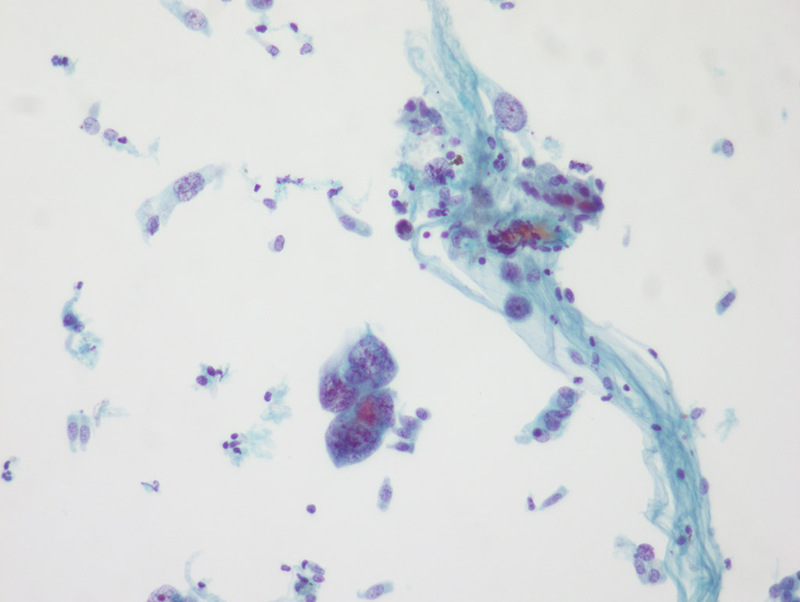 Characteristic hemosiderin-laden macrophages and spindle-shaped stroma are often not present, as in this case. Differential diagnosis: Well-differentiated endometrial adenocarcinoma has loose but usually 3-dimensional clusters of cells with coarse chromatin and nuclear membrane irregularities. Some cases may have low N/C ratio as well. The bland nature of the cells in this case favor a benign entity. 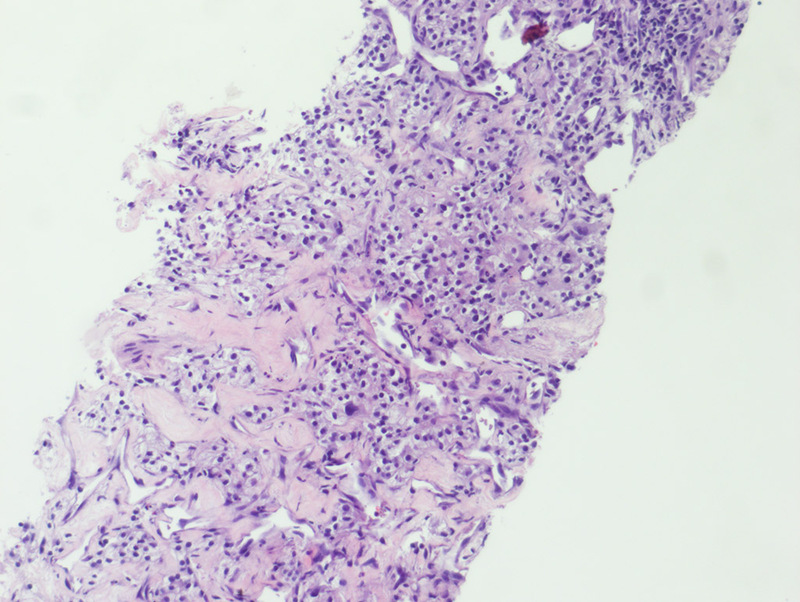 Immunostains with ER and CD10 (such as this case) can help cinch the diagnosis, along with the appropriate clinical history, such as abdominal pain or hematuria that occurs in a cyclic pattern. 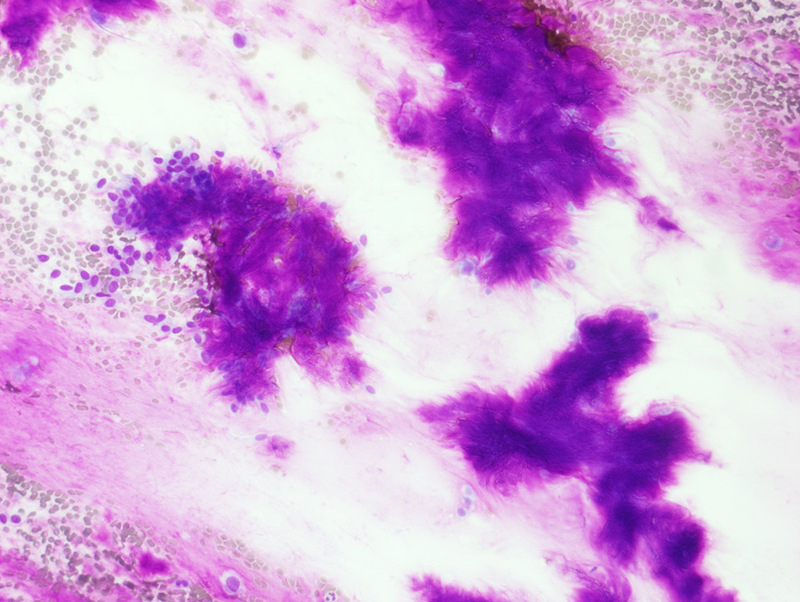 Hemosiderin-laden macrophages should not be mistaken for malignant melanoma. 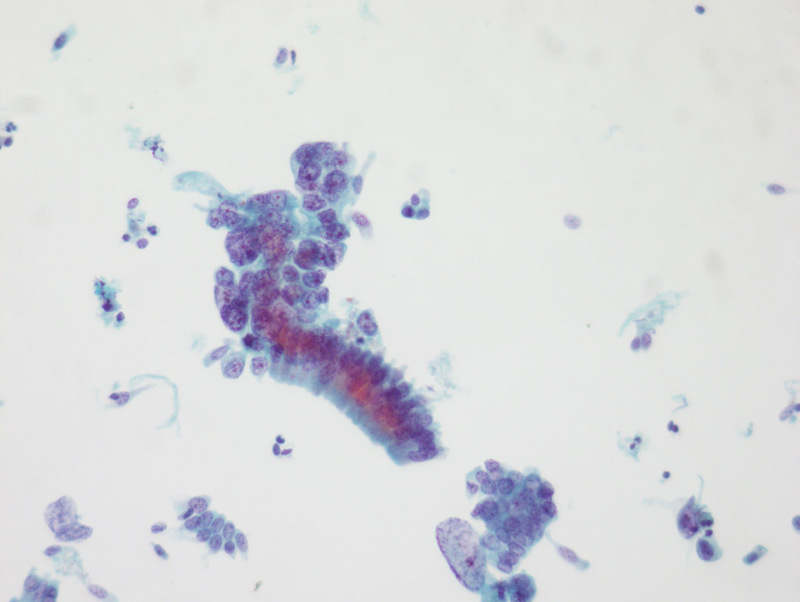 71 year old female, Cervical cytology. 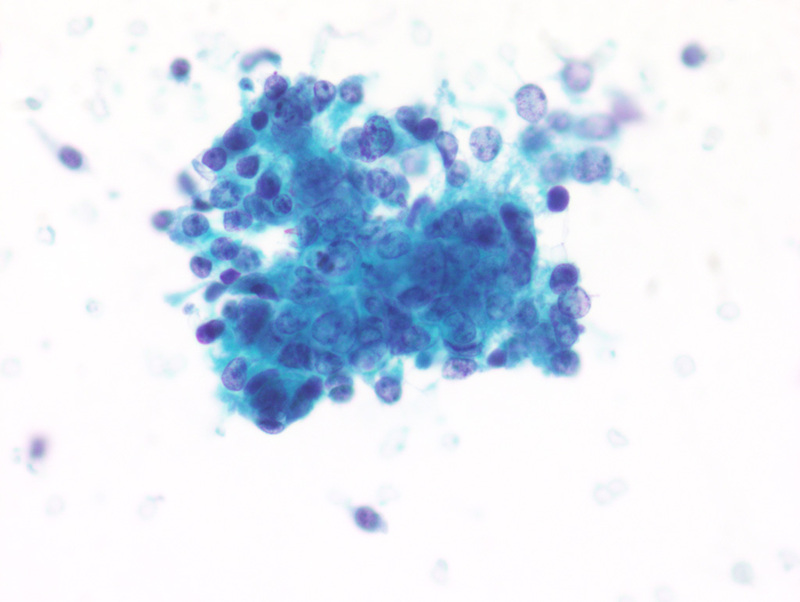 71 year old female, Cervical cytology (Surepath). Surgical pathology diagnosis – uterine serous carcinoma. 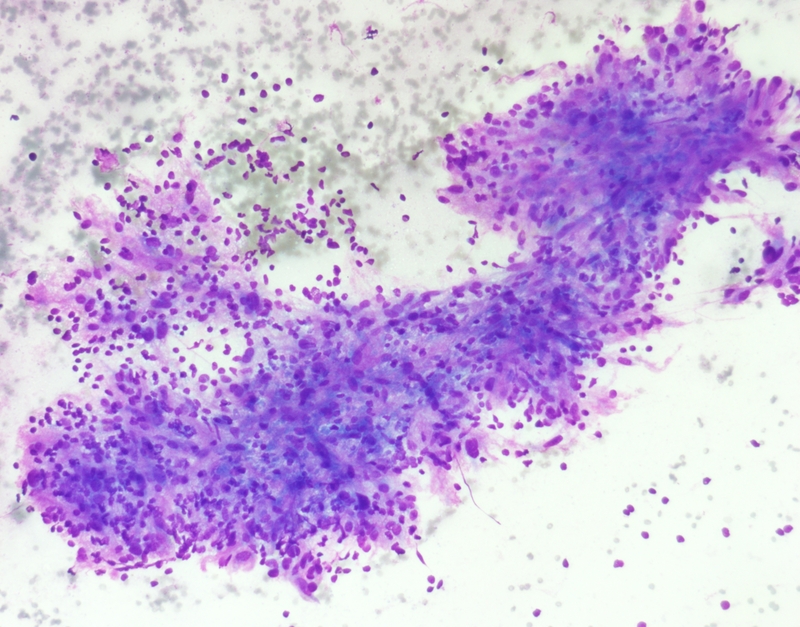 Cytologic features: This GYN pap shows hyperchromatic crowded groups in tight clusters. The glandular cells show enlarged nuclei with hyperchromasia and irregular chromatin distribution. Prominent nucleoli are seen. The cytoplasm is scant, and may be vacuolated. 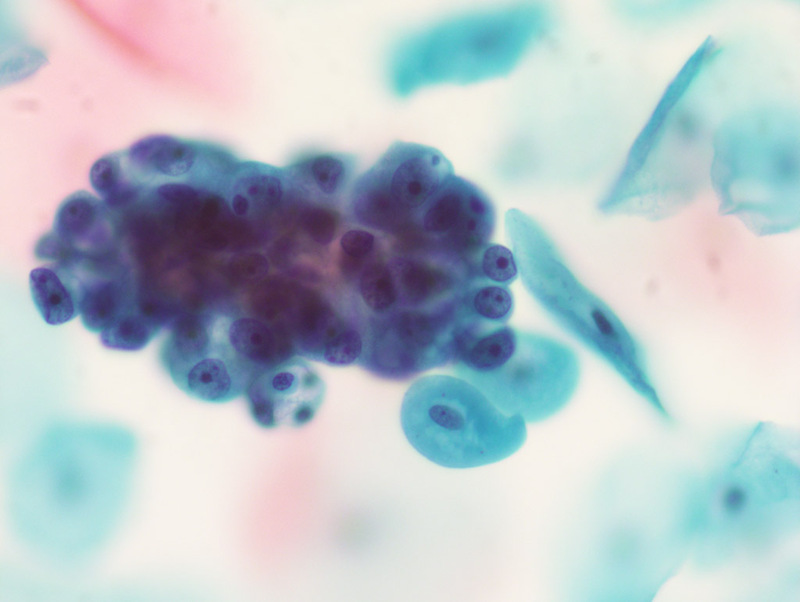 Differential diagnosis: The cytological findings of endometrial adenocarcinoma depend on the grade of the tumor. 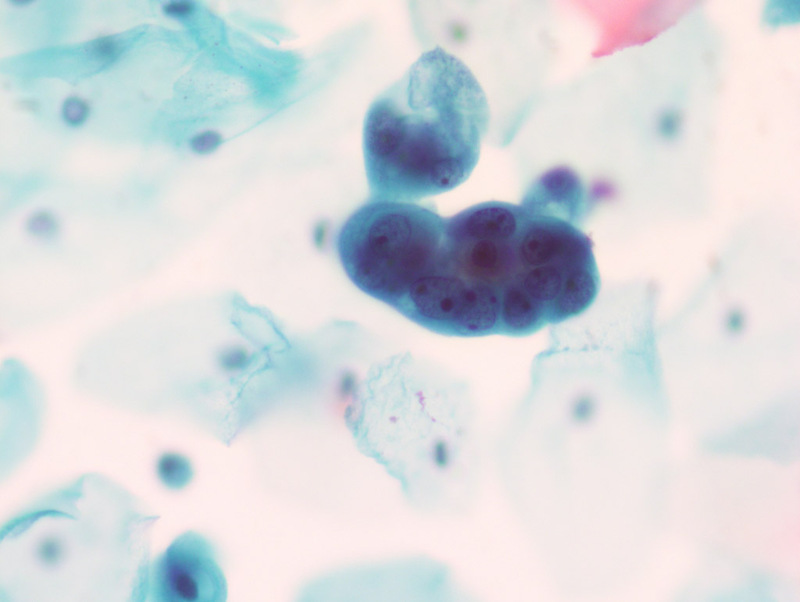 The differential diagnosis of hyperchromatic crowded groups in a pap smear include reactive endocervical cells, HSIL, AGC (endocervical vs. endometrial), and endocervical adenocarcinoma/AIS. 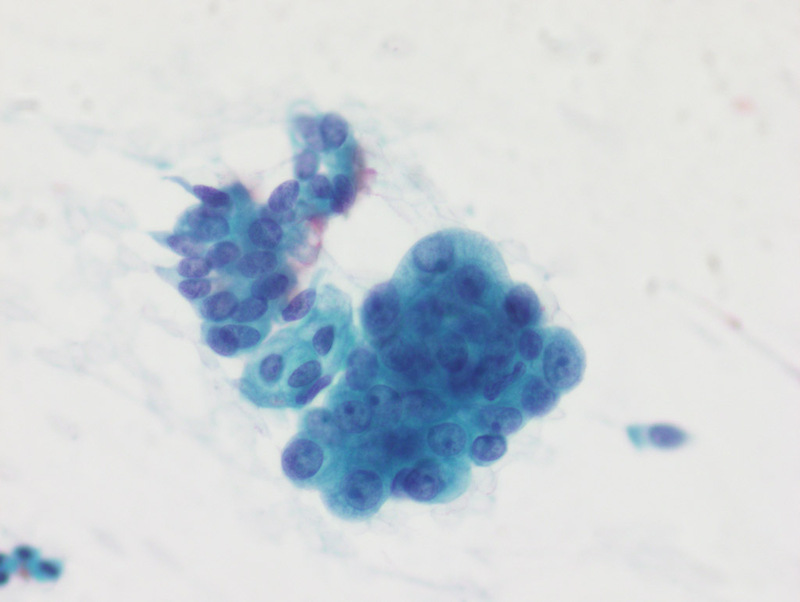 Reactive endocervical cells are usually present in streaming sheets with enlarged nuclei and prominent, often multiple nucleoli. However, nuclear membranes are smooth and the chromatin is finely textured. Endocervical lesions typically show more columnar cells with a pseudostratified, “picket fence” configuration. AIS shows characteristic feathering. The cell groups of endometrial origin are typically more rounded, with flattening of the cells on the outside forming a ball-like cluster. The cells in HSIL may form syncytial clusters that resemble endometrial or endocervical cell groups. In HSIL the cell groups are often flatter on the outside edge, which is not seen in endocervical groups. However if the HSIL involves endocervical glands, this distinction may be difficult. 81 year old female with a biliary stricture. A bile duct brushing was obtained (Thinprep). Cytologic description: In this ThinPrep slide, atypical cell clusters show anisonucleosis, with nuclear enlargement > 4 times a normal nucleus, as well as nuclear contour irregularities and prominent nucleoli. The normal honeycomb architecture of bile duct epithelium is disrupted, showing nuclear crowding and overlap. 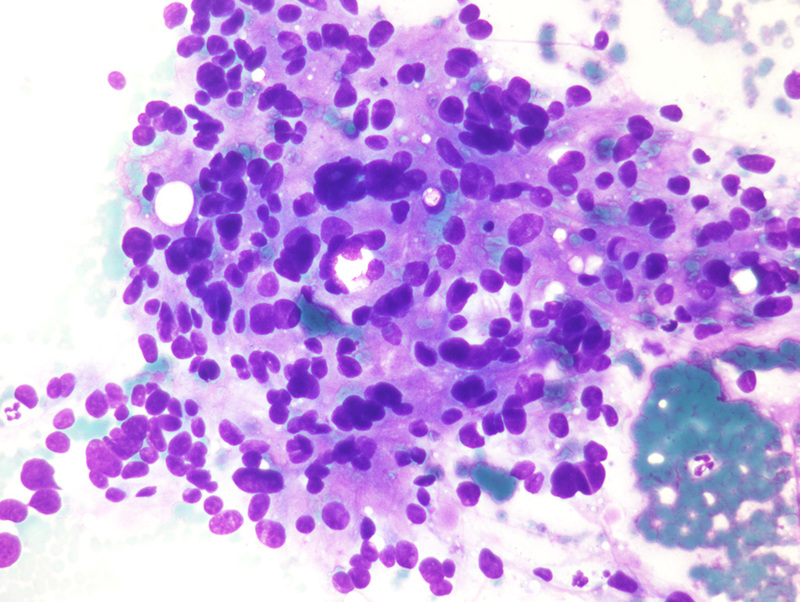 Few scattered single malignant cells are seen in the background. These characteristics are typical of a biliary duct adenocarcinoma. Differential diagnosis: Normal biliary epithelium displays flat sheets of evenly spaced nuclei in a “honeycomb” arrangement. The nuclei are uniform in size, round to oval, centrally located, with smooth nuclear contours and little nuclear overlap. The nuclear to cytoplasmic ratio is low, and small nucleoli may be seen. Reactive biliary epithelium can show focal marked atypia, with unevenly spaced, enlarged nuclei, typically 2-3 times of normal size. They may show small- to intermediate-sized nucleoli, sometimes multiple. In reactive cells, nuclear contours are smooth, and inflammatory cells are often present in the background. 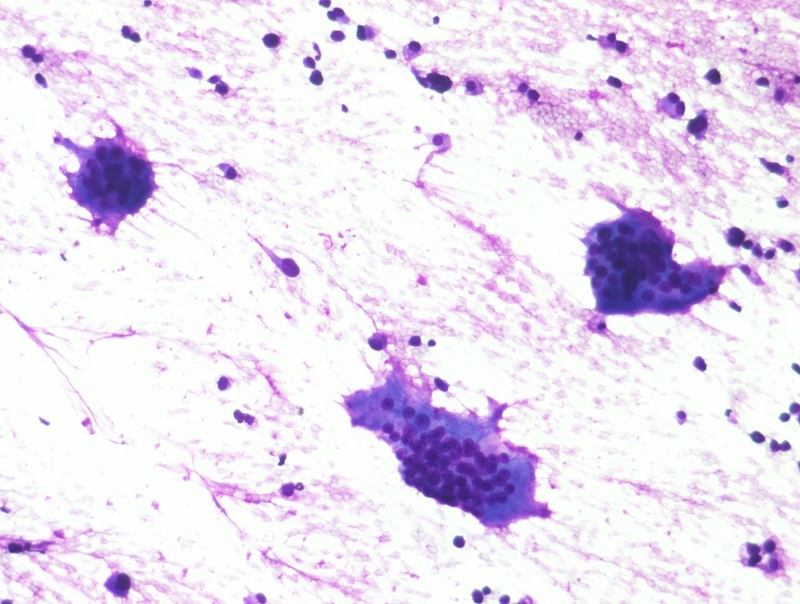 Neuroendocrine carcinomas show monotonous tumor cells with speckled chromatin, and stain positive for neuroendocrine markers such as synaptophysin and chromogranin. A 69 year old female with a right parotid mass. Ultrasound guided fine needle aspiration was performed. Pleomorphic adenoma (PA) is the most common tumor in all salivary glands, both in children and in adults. Two thirds of parotid tumors and 50% of all salivary gland tumors are PAs. The most commonly encountered site is the superficial parotid. 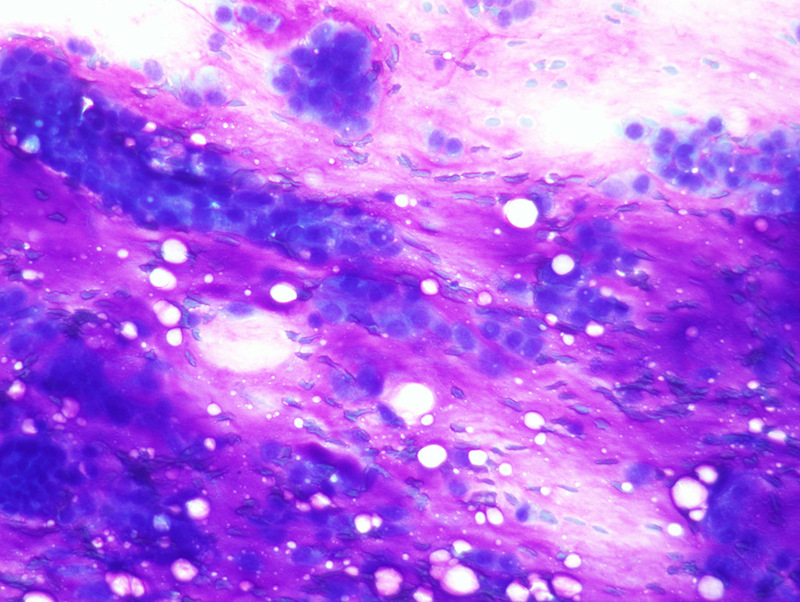 Cytologic description: PAs show a characteristic magenta fibrillary chondromyxoid matrix material on Diff-Quik stain. 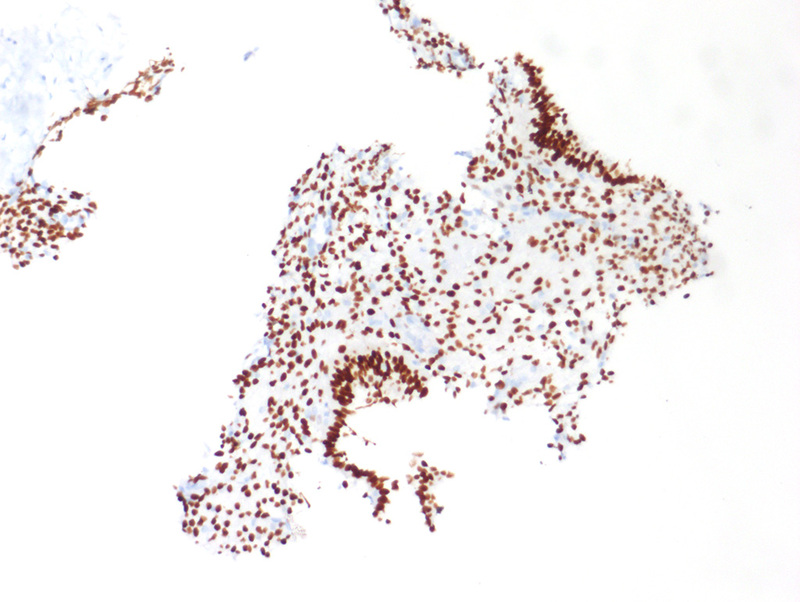 The matrix stains pale blue on the Pap stain. Epithelial cells are difficult to distinguish from myoepithelial cells, which may be spindle-shaped, epithelioid, or plasmacytoid. In this particular case, many myoepithelial cells can be seen entwined in the matrix. Differential Diagnosis: The differential diagnosis includes basal cell adenoma or adenocarcinoma (if epithelial-rich) and myoepithelioma (if myoepithelial-rich). Cases where the magenta matrix resembles round globules raise the differential of adenoid cystic carcinoma, which can occasionally be seen in a PA. The absence or paucity of matrix may preclude a definitive diagnosis of PA, and a diagnosis of “salivary gland neoplasm, low grade” may be rendered. 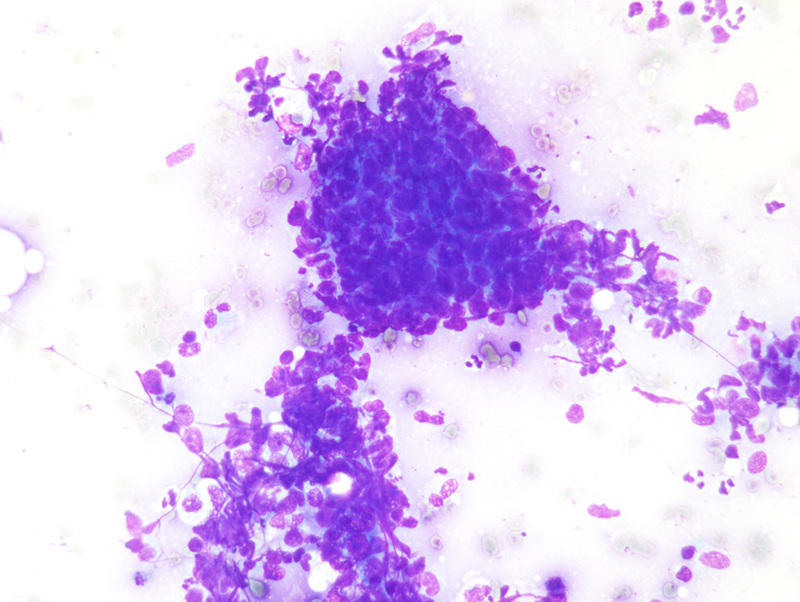 Focal, mild cytologic atypia is acceptable in a PA. However, features such as severe atypia, necrosis or abundant mitoses suggest the possibility of carcinoma ex pleomorphic adenoma. Mucinous metaplasia may be present focally in a PA, but if extensive, raises the differential diagnosis of mucoepidermoid carcinoma, possibly arising in a PA.
A 69 year old male with a renal mass. Ultrasound-guided fine needle aspiration. A 69 year old male with a renal mass. Ultrasound guided fine needle aspiration. 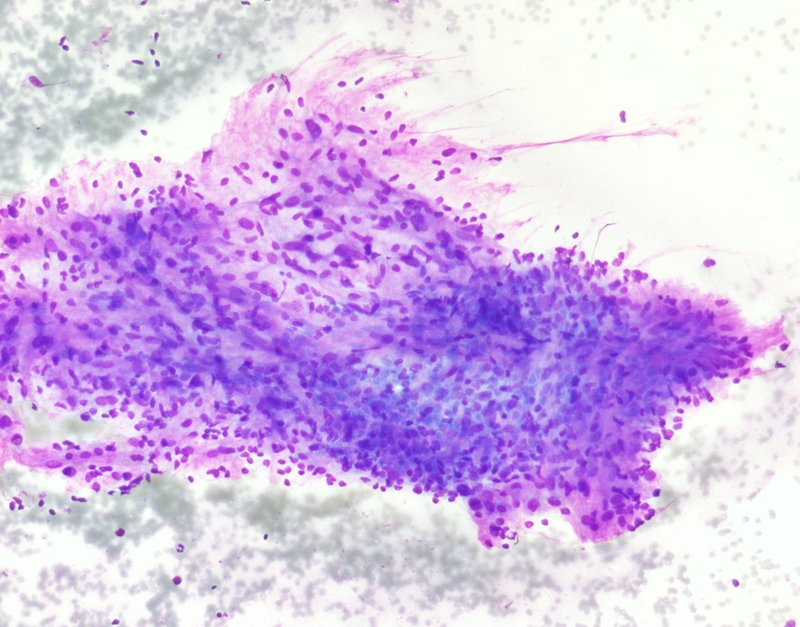 Cytologic description: The smears show large cohesive groups of epithelioid cells with large, round, eccentrically placed nuclei and abundant, wispy and vacuolated cytoplasm with chicken-wire vasculature. Pink, strandlike fibrillary material is seen on the diff quik stain, and is highly characteristic of RCC. The nucleoli vary in size depending in the Fuhrman grade of the tumor. Aspirates are often very bloody. Differential diagnosis: The differential diagnosis includes benign tubular cells, which are rarely in large groups and do not have vacuolated cytoplasm. Macrophages, can mimic the cells of RCC but are more dispersed as single cells, and lack nuclear atypia. Angiomyolipomas may have an epithelioid morphology, and can be misdiagnosed as RCC. Similarly, some high grade papillary RCCs are difficult to distinguish from clear cell RCC by morphology alone, and may require additional studies such as immunostains or cytogenetics. Immunostains in cases of clear cell RCC are positive for PAX8, PAX2, EMA, and CD10. A 67 year old female with a left lower lobe lung nodule. Transbronchial fine needle aspiration. Cytologic description: In the diff-quik slide there are multiple three-dimensional clusters of epithelial cells with large, eccentrically placed nuclei featuring prominent nucleoli and finely textured chromatin. The cells have high N/C ratio and foamy to vacuolated cytoplasm. Adenocarcinoma is the most common type of lung cancer. There is great heterogeneity in the cytomorphology of lung adenocarcinoma. They may be arranged in flat honeycomb-like sheets, three dimensional clusters, acini or papillae. Mucinous adenocarcinomas may show mucin vacuoles in the cytoplasm. TTF-1 and Napsin immunostains are positive. Differential diagnosis: The differential diagnosis includes reactive bronchial epithelial cells, which have cilia and prominent nucleoli, but should retain a normal N/C ratio. 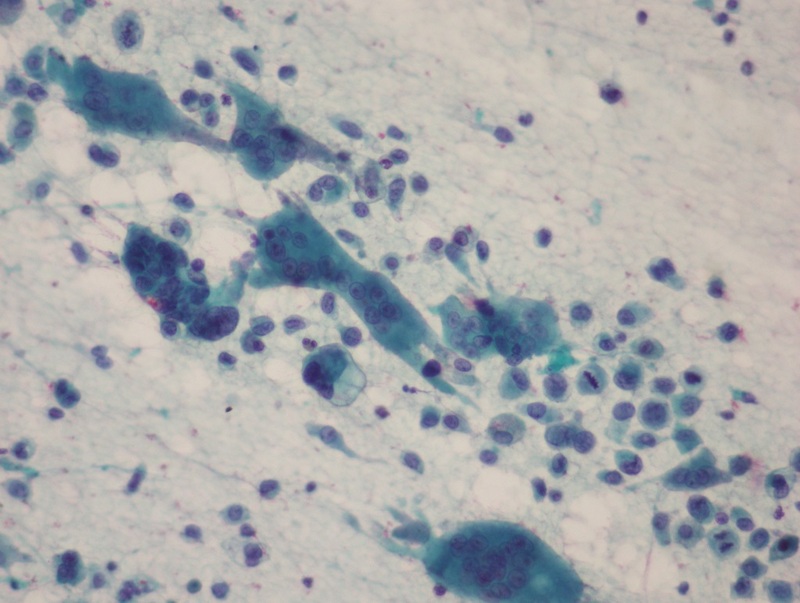 Squamous cell carcinoma usually has robin-blue dense cytoplasm without prominent nuclei, and the cells are positive for p40. Neuroendocrine carcinomas feature speckled chromatin, and small cell carcinoma showing molding and crush artifact with a higher N/C ratio. Adenosquamous carcinoma has features of both squamous cell carcinoma and adenocarcinoma.